PRINCETON, N.J. - Gazelle Group president Rick Giles today announced the inaugural Sunshine Slam Division I men’s college basketball tournament will take place November 8-10, 2019 at Silver Spurs Arena in Kissimmee, Florida. "We are proud to add the Sunshine Slam to our roster of events," said Giles. "The Sunshine Slam will feature eight teams from across the country competing for a championship the first weekend of the college basketball season. It’s a great way to tip-off the 2019-20 season. "We are pleased to be working with the Central Florida Sports Commission, Osceola Heritage Park, and Osceola County. They have been extremely supportive of the Sunshine Slam and their enthusiasm for it has been tremendous. We look forward to a long and successful relationship with them." The Sunshine Slam (@thesunshineslam) will be a bracketed tournament with each team guaranteed to play three games at Silver Spurs Arena. "We are thrilled to partner with the Gazelle Group, OHP, and Osceola County to bring a new eight-team, NCAA Division I men’s basketball tournament to Central Florida," said Jason Siegel, CEO of the Central Florida Sports Commission. "With the abundance of attractions and amenities available in Kissimmee and Osceola County, we are confident the Sunshine Slam will grow into an annual event that teams are lining up to participate in." "We are pleased to welcome the inaugural Sunshine Slam basketball tournament to the Silver Spurs Arena at Osceola Heritage Park," remarked Robb Larson, General Manager of Osceola Heritage Park. "We look forward to working with the Gazelle Group and the Central Florida Sports Commission to add an NCAA Division I college basketball tournament to our calendar of successful annual events." "Bringing a basketball invitational with NCAA Division I teams to the Silver Spurs Arena is great news for sports fans, the facility, and our county," said Osceola Commission Chairman Fred Hawkins, Jr. "The Gazelle Group has an established track record for creating similar events in other markets successfully. I look forward to seeing these eight teams from around the country competing here - and for this to become an annual event on Osceola’s sports calendar." 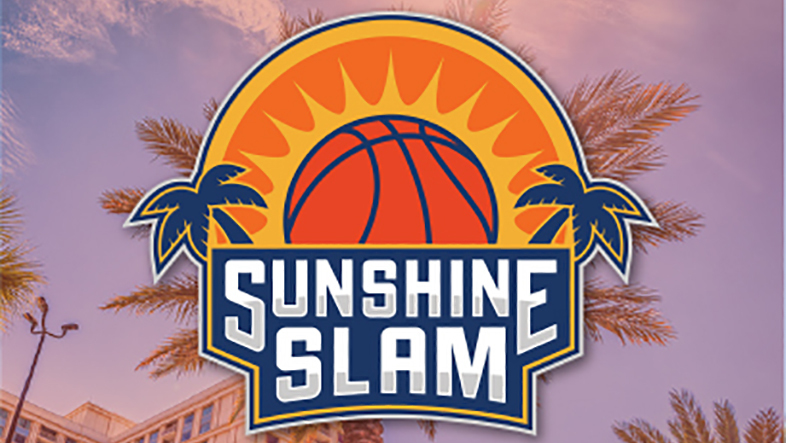 The field for the 2019 Sunshine Slam will be announced at a later date. The Sunshine Slam is produced by the Gazelle Group of Princeton, N.J. The Gazelle Group is a sports marketing firm, specializing in event production and management, client representation, and sponsorship consulting. Gazelle produces numerous nationally-recognized events, such as the 2K Classic benefiting Wounded Warrior Project, the GotPrint.com Legends Classic presented by Old Trapper, the Gotham Classic, and the College Basketball Invitational. For more information on the Gazelle Group, please visit gazellegroup.com. The Northeast Conference (NEC) is the sponsoring conference of the Sunshine Slam. Now in its 38th season, the NEC is a NCAA Division I collegiate athletic association consisting of 10 institutions of higher learning located throughout six states. For more information on the NEC, visit the official website at www.northeastconference.org or follow on Twitter @NECsports. The Central Florida Sports Commission (CFSC) is a private, non-profit organization established to attract and manage sports-related events, conferences, and activities that drive positive economic development in the City of Orlando, Lake County, Orange County, Osceola County, and Seminole County. Founded in 1993, CFSC has hosted or co-hosted more than 1,240 events in Central Florida with a total economic impact exceeding $1.4 billion in spending within our community. For more information, please visit www.centralfloridasports.org. Opened in 2003, Osceola Heritage Park in Kissimmee, Fla., is Central Florida's Entertainment Complex and the only venue in Central Florida with 150 wide open, secure acres, a 10,500 seat indoor Arena, a 90,000 square foot Events Center, and 5,500 seat Stadium. This provides promoters and meeting planners total flexibility and unlimited options for any type of event. Osceola Heritage Park routinely hosts concerts, festivals, rallies, consumer shows, amateur and professional sports, trade shows, equestrian events, political events, business meetings, conventions, and more. Osceola Heritage Park is minutes from downtown Orlando, Disney World, Sea World, and Universal theme parks.